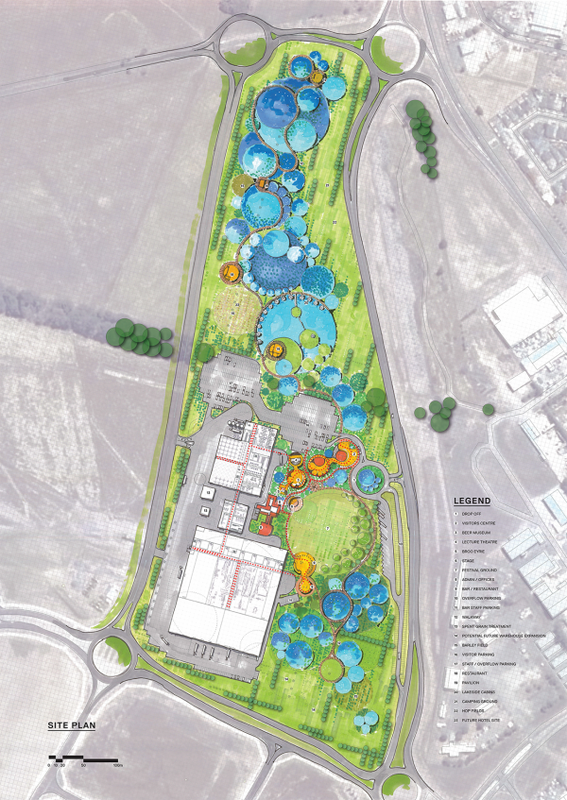 Decibel Architecture won an invited competition to design a brand-new brewery in Ballarat, Victoria, that when complete, will be the third largest in Australia. 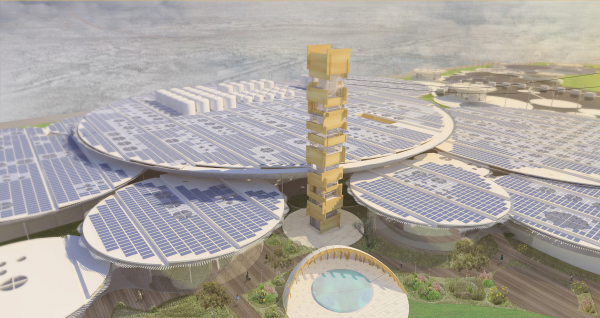 The competition brief required a building and landscape strategy that would allow for 100% renewable sources of energy to be generated on site, all waste water to be treated on site, in form that had to be engaging to the public, and achieve One Planet certification, a rating tool that considers both environmental and community impacts. 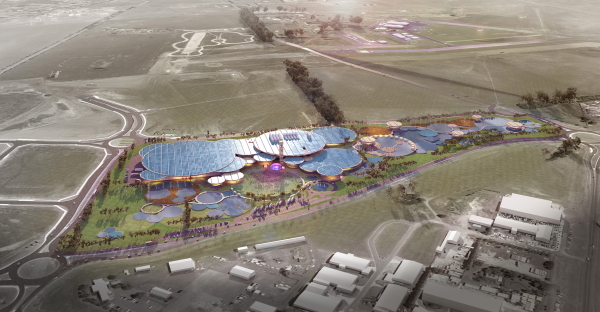 Decibel’s proposition is founded on the idea that Broo at Ballarat will be more than just a factory, should be more than simply a place of business, and must be more than another public venue. Our scheme knits the brewery, landscape and public spaces into a place and philosophy that the local community can be part of and proud of and will drive a regional and global cultural engagement in sustainable brewing best practice. 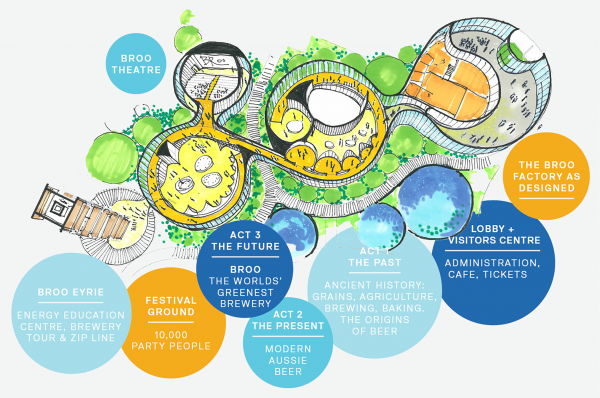 Whether seen from the air or experienced inside, the design and form of the Broo Brewery is inherently circular. Circles, like droplets and ripples on water, like bottles and glasses, like lakes and ponds are key to the concept of life and growth. Beer is a process driven by life and growth, and we have sought to create a meta narrative across the site that works at all scales- from 6 hectares of water bodies to 4.8Ha of solar, through to the round paddle with smaller taster glasses in the hand of the guest. The Broo Brewery is more than just another public venue or beer hall. A visit to the brewery begins in the Museum, which is both the main public entry to the site and the departure point for tours. 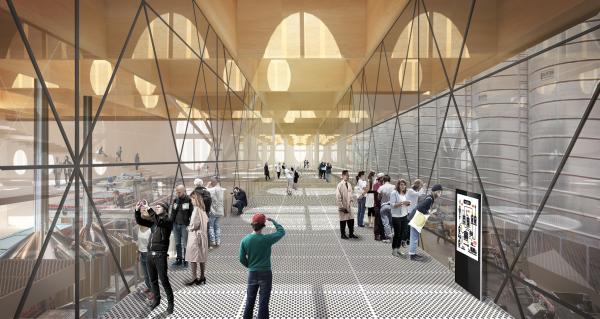 Decibel Architecture have designed the museum to be both visitor centre and the first stop on the tour. Visitors begin by making their way in a loop through the space where the history of beer, the history of Australian beer, and the future of beer are explained. Exiting the museum, visitors can elect to make the trip up the Eyrie, a 40m high tower that will provide an unrivalled 360-degree view of the site and the broader Ballarat area. The tour then continues as a sequential journey through the brewing process from raw materials, with hops and barley grown on site, to brewing and packaging, and then returns via a bar / restaurant to the museum. The Broo Brewery is a consolidation of ideas and aspirations that aim to better the experience of patrons and workers alike. The brewery is set to become a milestone project in its ambitions for driving radical positive change and becoming a catalyst for sustainable processes and practices within the beer brewing industry. Decibel undertook workshops with Cundall, the world's first accredited One Planet Consultancy, and the only one in Australia to better understand the requirements of achieving One Planet accreditation. On top of this, the brewery aspires to become a new heart and cultural epicentre within the greater Ballarat area for both locals and tourists. 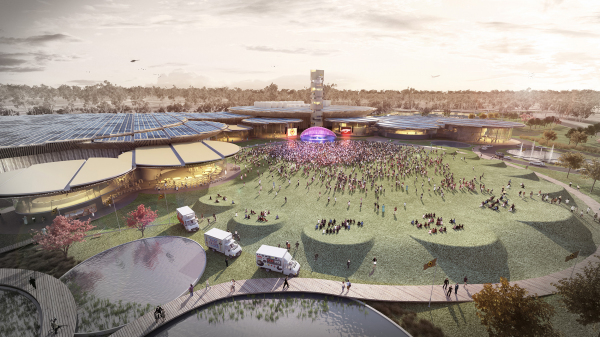 A multi-functional outdoor space for concerts, expos, market stalls and outdoor events was seamlessly weaved into the sites overall circular motif, forming an open and integrated outdoor space capable of accommodating 10,000 punters. Pavilions and boardwalks are dotted around the site, which allow visitors to navigate through hop and barley fields, to better understand the genesis of beer and where and how it is created. A designated campground will allow visitors to stay and enjoy the serenity of the area and to take pleasure in the sense of community inherent to country towns throughout Australia. The key design challenge of this project was integrating the precise planning and spatial requirements of a brewing production line designed by Krones in Germany, with a built form that would achieve the client’s ambition of a future brewery capable of holding events for up to 10,000 people and most importantly, not look like a factory. 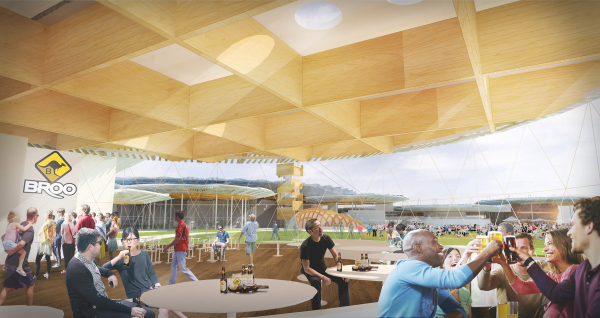 The proposed CLT structure developed in association with XLam Australia achieves 24m clear spans through an innovative grid-shell roof truss design that allows columns to be moved if and when the brewing equipment is upgraded. This timber structure naturally modulates moisture and is designed to allow skylights throughout the various production areas to naturally light workspaces and reduce the need for artificial lighting. The roof area extends beyond the perimeter walls of the production buildings to provide passive thermal design and also maximise available area for photovoltaic cells. Our landscape strategy is both geared towards the demands of the public facing brief but to also provide passive filtration of waste water on site through a series of pools and water features. The result is a landscape and building that help us achieve a reduction in water used to brew beer from the industry standard of 5-6 litres per litre of beer down to 1.2litres per litre of beer, all powered by renewables on site. It is a first of its kind to be conceived anywhere in the world, and it is happening in Ballarat. Sustainability is seamlessly woven into the brewery’s scheme and was at the heart of the client’s brief; to create a brewery that is the greenest and cleanest in the world. 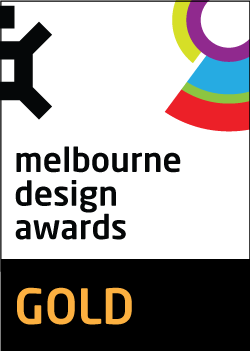 Decibel Architecture’s approach to this was multi-faceted, implementing innovative technologies throughout the scope of the project. Our site analysis of solar access and prevailing winds indicated that to generate all power on site, advised by CJ Arms as between 35-50Mwhrs per day, a significant solar and wind farm would be required. To achieve solar aspirations, Decibel Architecture developed the roof of the brewery as a grid shell structure to be constructed using Cross Laminated Timber (CLT), a material lauded for its carbon sequestering capabilities. The circular nature of the building’s roof allows for generous overhangs over the rectangular factory beneath. This increase in overall roof area, comprising around 90% of all external surface area allowed for 49,600sqm of solar panels to harness over 230 days of sunshine. 74 vertical axis wind turbines have been strategically placed throughout the site to take advantage of Ballarat’s prevailing winds, which on average nearly double that of Melbourne’s. The mantra ‘nothing in, nothing out’ helped shaped the extensive water treatment facility. 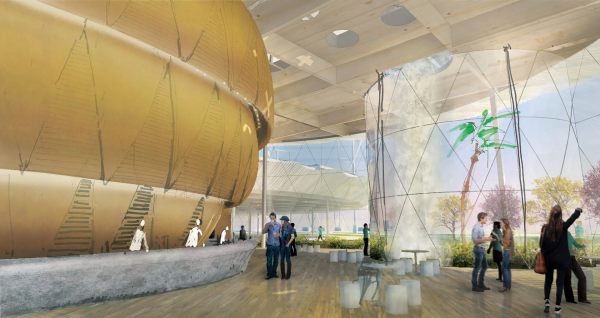 Designed by CJ Arms, the 47,300sqm facility ensures all water is collected, treated and recycled on site.